Anyone familiar with Dostoevsky’s The Brothers Karamazovshould remember the teaching in that novel of the Elder Zossima. He states that “each man is responsible for the sins of every man,” and holds this realization as the key to the life of paradise. 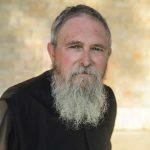 The great novelist is not inventing a new idea, but simply allowing one of his characters to give voice to a teaching that is essential to the Orthodox life. We are told in a variety ways that we should pray for all, including our enemies – though the Scriptures do not always say much about how that is to be done. Many people find it hard to pray for enemies, much less forgive them. The Tradition of the Church, particularly surrounding the life of prayer, has much to say about such prayer. 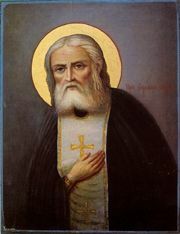 The Elder Sophrony, following the Tradition of the Fathers and most specifically his spiritual father, St. Silouan of Mt. Athos, offers perhaps the most complete teaching on prayer to be found in modern writings. His teaching is very much related to the understanding of prayer as communion (koinonia) with God (which I mentioned in yesterday’s post). 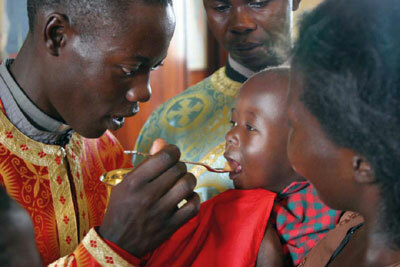 But his teaching expands that communion to include communion with others and finally with the whole world. Thus, when we are praying for another, when we pray our best, it is not as one autonomous individual talking to God about another autonomous individual, but instead we speak as a Person who is in communion with the one for whom we pray, and thus their sins become our sins and we pray for them as Christ prayed for us. The Elder Sophrony referred to this kind of prayer as hypostatic prayer (hypostasis being Greek for Person). To exist truly as a person is indeed to exist in a state of communion with other persons (including the Tri-personal God). It is this communion that is the ground of our true being in Christ. When I visited the Monastery of St. John the Baptist in Essex, England, two summers ago, I found a community of monks and nuns who had been nurtured deeply in the teachings and living Tradition of Elder Sophrony and St. Silouan, and through them the Living Tradition of the Church (for they are the same). Most of the services in that monastery follow the “cell rule” of Mount Athos and consist of about two and a half hours of the Jesus Prayer, recited by different leaders, in a variety of languages. One of the common variations I heard there was: “Lord Jesus Christ, Son of God, have mercy on us and on Thy whole world.” This is prayer that unites itself with the very heart of God who wills only salvation for the world, regardless of what the world wills for itself. It is prayer as communion – both with the Good God Who Loves Mankind, and with all mankind, saint and sinner alike. And it is in this state alone that we find the fullness of communion with God, for Christ did not come to save the righteous but sinners. I’ve been very interested in your descriptions of the Jesus prayer according to the practice of the monastery in Essex. Are you familiar with anyone being given a blessing to do something like this in a parish? If so, what does it look like? Mark, I am a parishioner at St. Sava Orthodox Church, a parish in Plano, TX. We have Jesus Prayer services on a weekly basis during Lent, in which we do just as Father Stephen has described here, although not in different languages, that I am aware. We start the service with the trisagion prayers, Come Let Us Worship, Psalm 142, The Creed, then begin rounds of The Jesus Prayer in sets of 100, separated by Glory to the Father, Now and Ever, 3 times until 300 prayers have been said. Then 33 prayers to our Patron Saint, Sava, to the Saint of the Day, and supplicatory prayers for all of the parishioners on the prayers list. Then another 100 Jesus Prayers, 100 Most Holy Theotokos Save Us, and finally, 100 Jesus Prayers ~ each set of 100 separated by Glory to the Father, and Now and Ever. The service is ended with the Magnificat and prayers of dismissal. Elaine, that sounds really quite wonderful. That’s very similar to the monastery’s practice, with some variation. I was not aware that any Orthodox parishes used the form of “We believe”. It is common in modern Western usage. A timely read for me. Thanks man. Fr. Stephen, I would like to second Isaac’s motion for the “Top 10 Books” list. Thank you. The massive amount of repetition is actually one of the few things I found rather difficult and off-putting in Orthodox worship. At a place I used to work, we started the days off with the traditional prayer at the third hour, and though I prayed it with them every day for a year, I never sensed the “Holy God, holy mighty, holy immortal have mercy on us”‘s and “lord have mercy”‘s over and over again to be spiritually uplifting (though I did with the psalms or the closing prayer that entreated the “calm haven of the storm tossed”). And yet some folks here respond with the prospect of repeating a phrase 300 times with “wonderful” when my reaction would be “how utterly dreadful”! Why do you suppose this practice seemed to yield so little fruit for me? And what virtue do you find in it? I think it’s a good question. Most of my experience with it as beneficial has been the ability to take the words into my heart and stay there with them, if that makes any sense. It’s like listening from somewhere other than discourse that needs change to keep the narrative going. That, I suspect, is a great change for many, and quite counter to the heavy narrative sense of our culture and the dominance of discursive reasoning. But it requires that we use a different part of ourselves, that everyone has, to enter into it, or to let it enter you. I usually tell people to be patient and to not fight the words – and, as possible – let their attention follow the words to their heart. When your mind wanders, bring it back. In an interesting sense, it’s not the repetition, it’s the paying attention to one thing (God) that’s really hard. 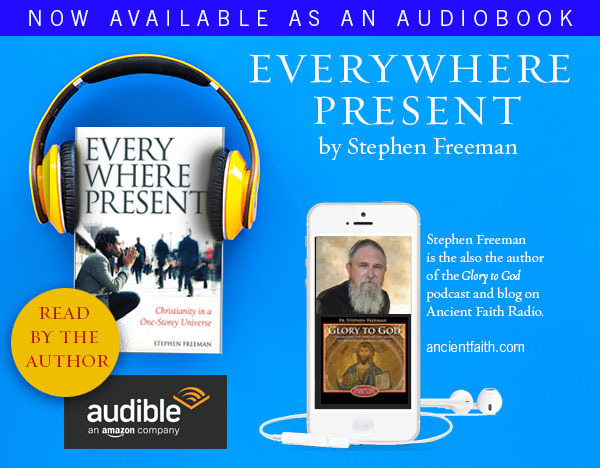 Not thought about God – just God Himself. Your reaction is not unusual. Do you know where this picture was taken? Where did you find it? I found it through googling on Orthodox Communion. It is from the Orthodox Church in Kenya (which is under the Greek Patriarch of Alexandria). I had this same reaction and experience. Now as an Orthodox Christian it is not mere repetition, but change and focus of the heart. Memory Eternal for Blessed Fr. Sophrony! Today is 15 years anniversary of his repose. 11 July 1993. Fr. Stephen, I would like to THIRD Isaac’s motion for the “Top 10 Books” list. Thank you. I am working on it, but being thoughtful and slow. It’s harder to do than I thought. Father bless! In the Orthodox Study Bible, some of the Psalms following introductory explanatory notes added to the Septuaguint are stated to be “For the End.” My Priest explained that this is a reference to Christ and that these Psalms, some of which express contrition for personal sin (a classic example is Psalm 50/51), are understood within the Tradition to be prayed by Christ on our behalf in solidarity with our fallen state. That was very eye-opening for me–that Christ Himself prayed this way. It shouldn’t surprise me, since that is also the way He lived, suffered, and died. This is also paradoxical in that in the Orthodox understanding of “Original Sin,” no other human being assumes the *guilt* for Adam’s personal sin in the garden, and neither, according to Scripture, does God punish any man for the sin of another in the way even Christ’s Atonement is often understood in religious circles. Yet as the result of death and corruption, which are the *natural consequence* of Adam’s trespass and organically passed down to all his children, virtually all who reach the age of becoming capable of personal sin, do commit it, and so it is right for the repentant to express solidarity with all their fellow human beings in sin. The Saints’ deep sense of compassionate solidarity with the “chief of sinners” coupled with the Orthodox understanding of sin as a “wound” is consistent also with the Apostle Paul’s teaching that if one member of the body suffers, all suffer with it (in 1 Corinthians 12:26). Though this is addressed the Church, I think it applies to all humanity as well. The compassion we are to show extends even to the estranged or potential members of Christ’s Body–perhaps, in a sense, especially to them as to the Prodigal Son and the Lost Sheep. In a similar parallel, I see a link between the second half of this verse in 1 Corinithians and Christ’s teaching that there is more joy in heaven over one sinner who repents, than in many righteous. As I have grown older, I have been made continually more aware that the fact I may not have committed certain more grave sins is entirely the result of God’s grace and having to do with many things completely outside of my influence or control. Every time I see or hear of any soul entrapped in grave sin, I remind myself, there but for the grace of God, go I (or any one of us). Even the ability to lay hold of God’s grace for oneself to be kept from certain sins is the gift of God. And even the most criminal action has its roots in wounds, needs, and sins that we all share in one form or another. The deep understanding of this in the Orthodox Saints is a true blessing. Would that we all were able to embrace it.